I love autumn, maybe because I’m born in this season. I love the colors and the changing of the season to autumn. When I lived in the Netherlands I loved to walk in the forest; seeing all those colors, hearing the crispy dry leaves, smelling the pine trees and feeling the cooling wind. Some years ago we came to live in Thailand. We love it! We love the weather, the food, the people, the culture and more. We have 3 seasons here up north; winter, summer and rainy season. We don’t have autumn. But, if you look and feel closely, you can see a bit of autumn in the changing from rainy season to winter. When winter comes the plants in the garden are slowing down and some seem to stop altogether. Temperature drops in the morning from average 25˚C to 15˚C. Teak trees are dropping their leaves. This gives me a feeling of autumn. Sarah of Winged Snail asks to bake with autumn flavors for Bread Baking Day #44. It took me some time to get the right feeling for her question. Living in Thailand for some years and thinking of autumn flavors was strange. Autumn for me is falling leaves, red and earth colors, taking long walks, sitting at a fireplace (this we do have). And autumn flavors are cinnamon, nuts, dried fruit, cardamom, sweet and a little bit tangy. 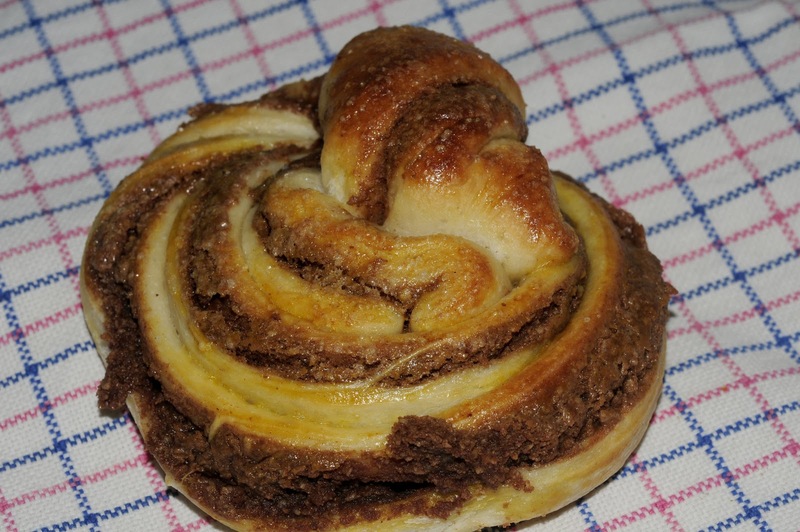 How lucky I was when I read about Kanelbullar; Swedish cinnamon buns. This is autumn for me. And they taste soooooo great, you have to make these. The crumb is soft with a hint of cardamom and the paste is absolutely delicious. The cinnamon paste stays soft and moist after baking, so you have a filled bun. And it looks nice too. I followed the recipe and baked 12 big kanelbullar. We shared them with friends and neighbours. In a kitchen machine blend the almonds with sugar. Add butter, cinnamon and water. Mix until smooth, if it’s too thick you can add a drop of water. On low fire melt butter in the milk, don’t let it get too hot it will destroy the yeast and flour. Add yeast, sugar, salt, cardamom and flour. Knead until you reach full gluten development. Transfer the dough to a slightly oiled bowl, cover with plastic and let rise for about 50 minutes or until it has doubled in size. I wanted to make some with dried fruit for Peter. I made 6 buns, 2 with pieces of dried small lemons, 2 with pieces of dried candied orange and 2 with pieces of dried dates. I like to play with a recipe. The original doesn’t need anything, but it’s fun. Place the dough on your work counter. Roll with rolling pin in a rectangle. The dough is about 1 cm thick. Smear the filling on half the dough. Cover the other half on top. Cut about 3 cm wide stripes. Hold your left hand in front of you, like you’re reading a note. Take a long strip in your right hand, turn the strip 2 times around your left hand, twist the strip and place the bun on parchment paper. Push the twisted end in the middle of the bun. Cover with plastic and let proof for 50 minutes. Check if the dough is proofed with your finger. When the dough springs back quickly, you must give it more time. When the dough comes back very slowly it’s proofed enough. In the mean time, pre heat the oven on 200ºC. Brush the proofed buns with whisked egg and sprinkle pearl sugar or coarse sugar on top. Bake the buns for about 20 minutes until they are done. Let them cool on a wire rack. I know you will enjoy all of them! I send this to Sarah of WingedSnail99, she is host for Bread Baking Day #44. They look delicious! Will try making them, I like the idea of having a spiced almond paste. I would love to make the rolls but I'm not clear on how to shape them. Any chance you could do a video? Also, what kind of dry yeast do you use? Instant? Thanks Sarah, they are delicious! Hi Shari,I placed your question as a comment under the recipe on my blog, so the answer might help others. You need to register for free to see the video they made. It's part of the series they do on television. The only problem is it's in Dutch! Without a video it's do-able. Hold your left hand in front of you, your palm facing you, like you’re reading a note. Take a long strip in your right hand, turn the strip 2 times around your left hand, twist the strip and place the bun on parchment paper. Push the twisted end in the middle of the bun. Since they were so delicious, I'll probably make them again soon. I'll try to make a video or good photos. I used dry instant yeast. Hope this helps you to make them too. I watched the show (24Kitchen) just yesterday and I had to try them out. I was looking around for an English translation and I found your "place". These buns (kanelbullar) are sooo delicious. We ate them for our breakfast today :). San Joaquin Sourdough, or is it tweaked too much?